Thoughts on being a Road Captain: Being a road captain is something that I will enjoy. Getting to set up new rides with good friends and meeting new people. Best ride? 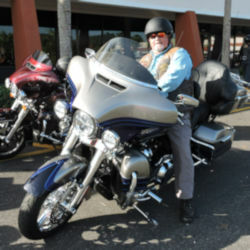 The “Best Ride” I’ve had to date was my first ride into Daytona Beach. Best ride? Any ride with friends. Dream ride? Any ride with friends. 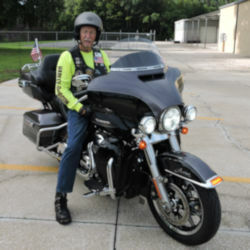 Thoughts on being a Road Captain: Leading people on motorcycle rides is something I enjoy doing. Best ride? 45 day trip to Artic Circle, Alaska and Canada. Dream ride? To southern tip of South America. Thoughts on being a Road Captain: Love being road captain to share great rides with others and breaking bread among friends. Thoughts on being a Road Captain: It’s a challenge and a handful! Dream ride? Haven’t been there yet! 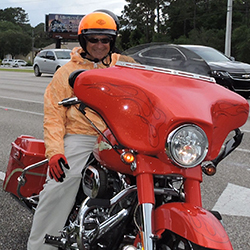 Thoughts on being a Road Captain: Lead safe rides and have fun! How long have you been riding a Harley Davidson? 20 years, 5 years on a Harley. Job? General Manager for Best Buy. Best ride? Anywhere in the mountains of North Carolina and Northern GA.
Dream ride? I want to ride to Sturgis and ride in the upper Northwest. Thoughts on being a Road Captain: I enjoy the challenge of finding new roads and stops in order to make the rides comfortable and exciting. I spend hours going back and fourth from Harley ride planner to google maps trying find new routes. I take pride in the preparation process from planning to the pre ride because I think it’s critical when our main goal is to keep the club safe and upright. Job? IT Management, Advanced Technologies, Automated Customer Service with Speech Recognition, Business Programming, Telephony, all around computer geek. Best ride? Renting a 2014 Ultra and riding the Mount Washington Auto Route in New Hampshire. 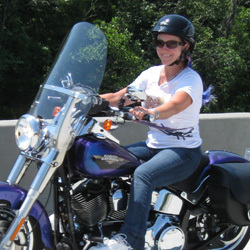 My daughter Aimee rented a Harley also and we were followed by Kathryn and son James in the SUV on Mount Washington. One of the most challenging parts was stopping and starting on an incline, something we don’t often do in Florida. It was a beautiful day until the clouds rolled in and we headed down the mountain back to our camp site and tent. Dream ride? I have a few rides I would like to do. Deal’s Gap, Glacier National Park, and Mount Rushmore are just a few. Growing up in the Adirondack Mountains makes me yearn for riding through the forests and back roads of our beautiful USA. Thoughts on being a Road Captain: I rode with the club a couple of years before considering becoming a Road Captain. Riding with OPHOG impressed me with how well organized a ride could be. 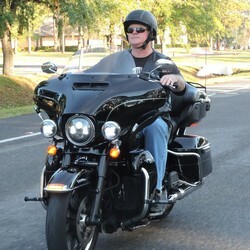 Now I look forward to leading and tailing rides so others can enjoy group riding with OPHOG. 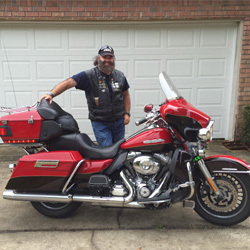 Thoughts on being a Road Captain: Road Captain responsibilities and duties I take very seriously he/she must make sure when planning a ride it is safe, enjoyable, and importantly gain the trust of the my fellow OP HOGs riding on my planned ride. I do believe that as a Road Captain I should try to plan rides that have a good destination venue which come with a planning and thoughtfulness. I want to remind all the riders on my planned ride to make sure their Harley is mechanically safe, good tires, lights all work, etc. 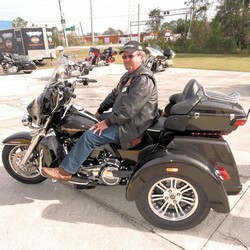 Last thought it I want all my rides to be as safe as possible and all to enjoy their Harley on the ride. Job? To make the rides fun and safe. Best ride? Any ride – alone or with friends. Dream ride? Haven’t thought about it. Best ride? Riding to the Keys with my husband on our honeymoon. It was hot but we had a lot of fun. Dream ride? Riding the back roads to Niagara Falls and Sturgis. Thoughts on being a Road Captain. “It’s all about the ride”. I love to ride and look forward to finding new places to go and spend time with good friends and eat some good food. How long have you been riding a Harley Davidson? Been riding Harleys 42 years. 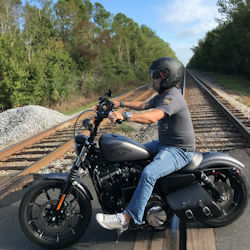 My first Harley was a 1972 Sportster then got a 1966 Shovelhead. I rode that bike for 37 years, 35 of that it had a foot clutch and a jockey shift on it. Best ride? Best ride was the ride to Sturgis and then the riding in and around the Black Hills, Custer State Park, Devils Tower, and Mount Rushmore. Dream ride? 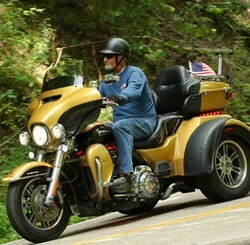 Dream ride will be back to Sturgis and then on to the Grand Canyon. Thoughts on being a Road Captain. Riding is not something I do just on the weekends when the weather is nice. It’s a lifestyle for me and I ride most everyday. It’s all about the experiences and the people you meet. Like they say, “it’s all about the ride”. I hope to ride with everyone and get to know a little about them. Dream ride? Around the world on a Harley. Thoughts on being a Road Captain: I doubt if anyone is going to keep up with me. Job? Retired, finally! Work at a gym 2 days a week. Ride the rest of the week. Best ride? 1998 to Arcata, California, down Route 101 & 1 to LA and back to Florida. Dream ride? Florida Peninsula Perimeter. Thoughts on being a Road Captain. Ride safety is number one concern on my rides. 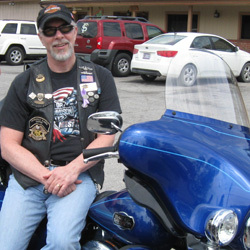 Chapter riding is the safest way to ride a motorcycle. I do it to meet new friends and renew old ones who I would never meet otherwise. What a great bunch of people I get to hang with. How long have you been riding a Harley Davidson? I have been riding Harley Davidson since 2005. 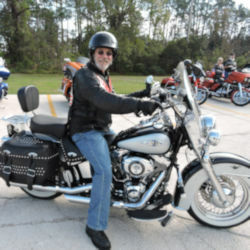 My first Harley was a 1988 Heritage Softail that I cruised around on for years. 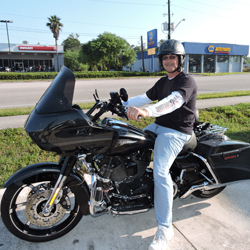 I got excited about Touring on a Harley in July, 2014 and bought a 2012 Street Glide. I traded up to a 2017 CVO in November of 2017. Job? I am the Electrical Engineering Manager for Delta Fountains. I oversee the Electrical Designs of Water Feature Systems (fountains), as well as Startup and Consulting Site Visits. Notable Systems are the 911 Memorial, NY Police Memorial, Metropolitan Museum of Arts in NY, Pentagon Memorial, and Oklahoma Bombing Memorial. Best ride? That’s hard! 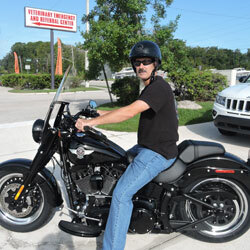 Any ride on my Harley is a great ride! Dream ride? Coast to Coast when I retire! Thoughts on being a Road Captain. It’s an Honor for me! Leading/Tailing and Planning rides is exciting. I look forward to many rides! How long have you been riding a Harley Davidson? I started riding in 1974 and took a break from 1978 to about 1993 I had a Yamaha 700 for a few years. Then I purchased my first Harley in 2004. Job? I own my own business with my wife Lori. We manufacture electrical control systems, and now she is manufacturing the Biker Braids that are found in the local stores. Best ride? Best ride I have been on? There are too many to choose from, but here are a couple of good ones. Another great ride I have been on would be the Great Adventure Ride as named by DrD. This was offered out to the chapter in 2010 and it caught my interest, Lori and I decided to go. We were a little concerned about being on the bike (and packing!) for 10 days straight, but as it turned out, it was no problem at all. It was wonderful. Again, time well spent with friends, building new friendships and making new memories. Dream ride? I don’t really have a dream ride but I think I would like to get on US 90 through Mississippi and Louisiana and probably further just to take a ride back in time. I have traveled some of US 90 through MS and LA and it looked like it had been untouched since it was built. The bridges were as old as the road and the rest stops were just small areas to get off the road with one picnic table. It just seems like it would be a nice ride on a motorcycle. Thoughts on being a Road Captain: Being a road captain is an avenue to further my riding experience and increase my awareness of riding safe. 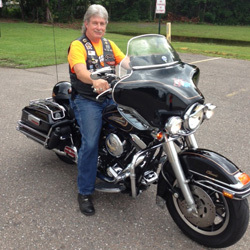 There are several road captains that I consider to be knowledgeable about safety and riding skills, and are well qualified to lead others on fun safe rides. I am looking forward to learning some of those skills during my time as a RCC. Once I get the basics under my belt and learn more about the things to look out for to make a ride safe I will be looking forward to leading my own rides. 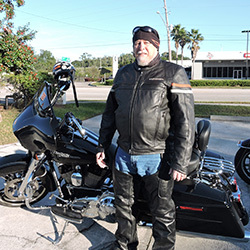 I enjoy being around the people I have met in the chapter and I am looking forward to leading or being tail gunner on rides and doing my best to make the rides safe for all who are participating. Job? 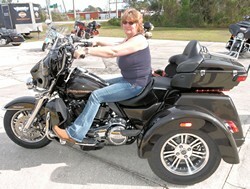 Business Owner – Lj’s Biker Braids and Control Tech of Northeast FL, Inc..
Best ride? 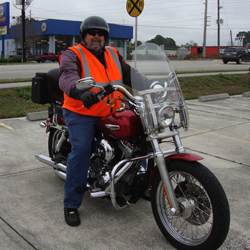 My favorite ride to date is the Great Adventure Ride 2010, the initial mountain experience was awesome!. Dream ride? I don’t really have a dream ride per se, but I would like to ride more of the east coast north & the west coast because I love the ocean. Thoughts on being a Road Captain: Because I like to ride in the front occasionally!!! And sometimes I like riding in the back!!! All kidding aside, I thought that if I added the Road Captain’s pay to the Treasurer’s it would be like getting a bonus! I think the way this training is set up brings safety to the forefront & I want to be as safe a rider as possible; and Jack & I can RC & TG each others rides…..how perfect! 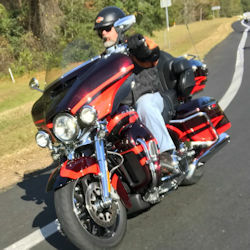 Thoughts on being a Road Captain: Provides a great opportunity to get out and ride with fellow Harley enthusiasts and share some of the great roads and restaurants in our area. How long have you been riding a Harley Davidson? 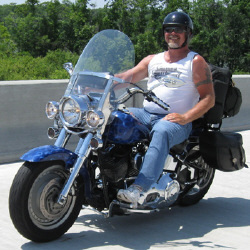 I have been riding Harley-Davidson for 14 years. 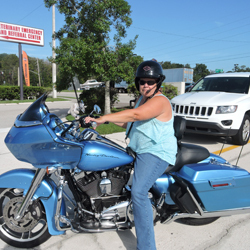 My first Harley-Davidson was a 2003 Ultra Classic. I have been riding motorcycles most of my life. Started off with a Honda Q50 when I was 4 years old. Thoughts on being a Road Captain: When riding is in your blood, what’s a better way to lead safe group rides and mentor new riders than becoming a Road Captain. It’s good riding with like-minded people. I will be looking forward to choosing my destinations, and leading my own rides. Thoughts on being a Road Captain: The pay was extra incentive but enjoy helping people get out and enjoy riding safely. The satisfaction of getting a group of people together, that all enjoy the same hobby and show accomplishment in achieving the goal of the day is rewarding. Best ride? My best ride is any really, with the club, friends or just riding. I have to say tho my best ride was with friends riding the tail of the dragon, devil triangle and all the back roads in GA and the Caroline’s. Dream ride? 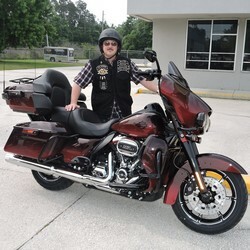 My dream ride is to start at mile marker 1 in the keys and ride the east coast north and then across to the west coast down the west coast and then back across east with a LOT of side stops. Mainly just going where the road and takes me. All back roads. Thoughts on being a Road Captain: I enjoy doing this! I enjoy finding new roads and new places to lead rides too. Helping new riders learn more about riding. 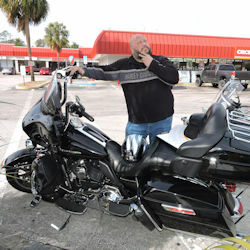 Helping others and other Road Captains plan rides. I enjoy tailing when ever needed and helping in any way I can. To promote safe in riding.